The author makes it clear this is a ghost story, but I kept resisting her hints and pushing for a spy thriller. Ultimately I acquiesced and that was when I began to more fully appreciate the plot as well as the fantastic writing. And the writing is fantastic. 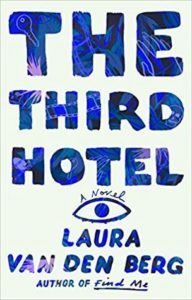 The continual detailed observations of other people, buildings old and new, even the colors of the ocean give this novel a solid sense of time and place even though the protagonist’s perceptions of the big picture are anything but solid. If this sounds weird, it’s still accurate. The author’s whole point is to explore how the ultimate isolation of the individual and the pain of great loss create a whole new way of looking at things, both internally and externally. I was impressed with the huge list of resource material the author consulted dealing with horror films, particularly Cuban horror films. However, don’t expect bloody messes. Laura van den Berg’s writing is closer to the non-violent horror of Hitchcock’s films, only her dizzying Dutch angles and other camera tricks are performed with words. In fact, as I write this piece, I realize I actually liked this book quite a bit. It just took me finishing it to realize that. Heh heh. Clare goes to a Havana horror film festival her recently deceased husband intended for them both to attend. She spots a person that looks just like him and begins a pursuit. For more about Laura van den Berg and her books, click here.